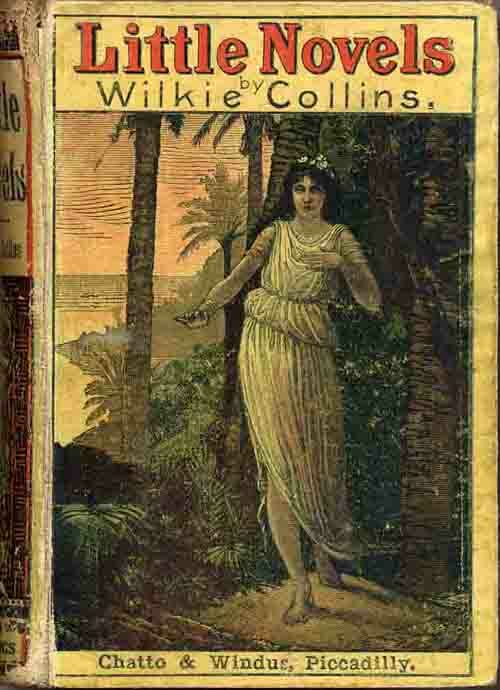 Wilkie Collins's collection of fourteen short stories published, after revision, in 1887. All had previously been issued with different titles in various American or English periodicals. Unlike Collins's earlier collections, After Dark (1856) and The Queen of Hearts (1859), there is no connecting narrative but most of the stories revolve around the theme of love and marriage, frequently across the social barriers of class and money. Some also include supernatural or detective elements. The original titles and publication details are given in parentheses. Supernatural short story written especially for the young Anne (Nannie) Wynne. It was originally published as 'The Ghost's Touch' in The Irish Fireside, 30 September - 14 October 1885; Harper's Weekly, 23 October 1885; and in The Ghost's Touch and Other Stories (with 'My Lady's Money' and 'Percy and the Prophet', Harper's Handy Series, no 30, 1885). Mr Rayburn, a widower, and his young daughter, Lucy, meet Mrs Zant in Kensington Gardens while she is experiencing a vision of her dead husband. The ghost warns her against his brother, who aims to force her into an illegal marriage. Rayburn rescues Mrs Zant, hoping to marry her himself, while the supernatural force returns to strike her brother-in-law with fatal paralysis. Originally published as 'How I Married Him' in The Spirit of the Times, 24 December 1881 and Belgravia, January 1882. Nancy Morris, a shopkeeper's daughter from Sandwich, becomes a governess with the help of a benefactor, Sir Gervase Damian. One day she helps a stranger whose advances she gently rebuffs, only to meet him again when she takes a new position in the North. Sir Gervase leaves Nancy £70,000 which she renounces in favour of the only other heir, his nephew. He turns out to be the stranger, Sextus Sax, who refuses the fortune until Nancy, in a Leap Year, proposes that he should accept both her and the money. Originally published as 'Your Money or Your Life' in the Belgravia Annual, Christmas 1881; the People's Library, 17 December 1881; and in The Seaside Library (vol. 57, No 1164), 1881. Collins acknowledged that the first part of the story where the landlady forces her young creditor into marriage was taken from Lockhart's The Life of Sir Walter Scott (1825). When Edwin Cosway hears that the wife he was tricked into marrying has died, he falls in love with Adela Restall. Her father objects and their elopement is foiled by the malicious Miss Benshaw who turns out to be Edwin's wife with her name changed to inherit the family fortune. She is drowned and her will leaves half a million pounds to Adela provided that she does not marry Edwin, a condition that Adela happily ignores. Originally published as 'Royal Love' in Longman's Magazine, Christmas 1884. Ernest Medhurst is unwittingly caught up in a minor political intrigue while second secretary to a small German Court. The Princess falls in love with him and to avoid the possibility of scandal affecting her forthcoming marriage her father ensures that Medhurst is duped into leaving the country. This ultimately works to Medhurst's advantage as he then marries Jeanne, the daughter of his old singing master. Originally published as 'She Loves and Lies' in The Spirit of the Times, 22 December 1883; and in Tales from Many Sources, vol 4, 1885. Collins presented the manuscript of the story to A. P. Watt in January 1884. Ernest Lismore is in financial difficulties. In return for a token marriage, he is offered help by the elderly Mrs Callender whom years before he saved from a fire. Lismore eventually agrees and they live abroad as mother and son until he meets an attractive girl in an art gallery. Forced to decide between the girl and his wife, he chooses the older woman only to find they are one and the same person. The artifice was to ensure that Lismore loves her rather than her money. Supernatural story originally published as 'The Clergyman's Confession' in The World, 4-18 August 1875; the Canadian Monthly, August - September 1875; in Golden Treasures of Poetry, Romance, and Art, Boston 1876; and in Papyrus Leaves, 1880. The story is told by a clergyman. Before he joined the church he met and fell in love with Miss Jeromette, a Frenchwoman alone in London. They enter on a relationship but she tells him candidly she loves another man who has deserted her. Miss Jeromette predicts the man will return to her but that she will die young and miserably. To please his dying mother the narrator becomes a clergyman and ends his association with Miss Jeromette. She dies as she predicted, and the clergyman sees a bloodstained apparition at the same time as her death. Although her lover is acquitted of murder for lack of evidence, the clergyman knows for certain who killed her. Originally published as 'A Shocking Story' in Barnes' International Review, 2 November 1878, and in the Belgravia Annual, Christmas 1878. Reprinted in book form by A. S. Barnes, New York 1878. Mina shocks Society by falling in love and marrying Michael Bloomfield, a groom in the household of her aunt and uncle with whom she lives. Discovering that her aunt has recognised the orphaned Bloomfield as her illegitimate son, Mina promises to conceal his true identity. Originally published as 'The Girl at the Gate' in The Spirit of the Times, 6 December 1884; and in the English Illustrated Magazine, January 1885. Reprinted in the Seaside Library (vol 100, no 2030), 17 August 1885. Lepel and his proud but impecunious friend, Rothsay, witness an Italian play which foreshadows their future lives. Rothsay is in love with a gatekeeper's daughter, Susan Rymer, who is herself in love with Lepel. Lepel falls mysteriously ill and learns from his eminent doctors that he is dying. Intending to help his friend, Lepel agrees to marry Susan so that she can become a rich widow and a suitable wife for Rothsay. Lepel's medicine has been poisoned by his housekeeper, Mrs Mozeen, and when by accident he stops taking it, he immediately recovers. Lepel now realises that he is in love with Susan but at the same time has blighted Rothsay's prospects. Originally published as 'The Captain's Last Love' in The Spirit of the Times, 23 December 1876; and Belgravia, January 1877. Collins sets a story in Polynesia for the first time since his earlier, then unpublished novel, Iolani. The stories are different but have in common a main female character called Aimata and a powerful high priest. There are also resemblances in the descriptive passages of the scenery. The Fortuna is blown off course in the South Pacific and visits an uncharted Polynesian island. While trading with the local inhabitants, the Captain falls in love with the Priest's daughter, Aimata. He plans to bring her to England but she is drowned during a volcanic eruption. The Captain now hates the sea and will never marry. Satirical short story originally published as 'The Mystery of Marmaduke' in The Spirit of the Times, 28 December 1878; and in Temple Bar, January 1879. Marmaduke Falmer falls in love with Felicity, a minister's daughter, while sheltering from a storm in the Scottish town of Cauldkirk. The minister visits the married couple in London because Felicity is worried about her husband's mysterious disappearance each evening. All is explained when Marmaduke confesses to being Barrymore, the actor, famous in a profession of which the minister wholly disapproves. Short story with supernatural overtones, originally published as 'Percy and the Prophet' as the Extra Summer Number of All the Year Round (2 July 1877) under the editorship of Charles Dickens Junior. Reprinted in book form with other stories by Tauchnitz, 1877; Harpers, 1877 and 1885. The action takes place in 1817. The mysterious Dr Lagarde, an emigre Frenchman scratching a living in London by fortune-telling, predicts in a hypnotic trance that Percy Linwood and Captain Arthur Bervie will fight a duel over Charlotte Bowmore. Everything occurs exactly as foretold but the two men are reconciled and become friends. Percy, now engaged to Charlotte, is involved with her father's ineffectual political intrigues. Bervie warns Percy and Mr Bowmore that warrants have been issued for their arrest but when they refuse to flee the country he tricks them into leaving England by pretending to elope with Charlotte. After they have arrived safely in Paris, Percy and Charlotte are married, while Bervie fulfils his own destiny thirteen years later in finding Dr Lagarde dead in the streets of Paris, shot in the French revolution of 1830. Originally published as 'The Duel in Herne Wood' in The Spirit of the Times, 22 December 1877; and reprinted in the Seaside Library (vol 44, no 905), 1880. Originally published in The Spirit of the Times, 25 December 1886; and in Belgravia, January 1887. The elderly Miss Dulane makes a marriage of convenience with the impecunious Lord Howel Beaucourt. The marriage is happy but she discovers that her newly engaged companion, Mrs Evelin, had been in love with Beaucourt under the assumed name of Vincent. Mrs Evelin had declined his proposal, wrongly thinking that her own late husband had disgraced her with a bigamous marriage. She leaves for New Zealand and on returning finds both that her marriage was in fact legal and Beaucourt's wife has died. The couple are free to marry and somewhat reluctantly accept a legacy from Lady Beaucourt's will. Short story of revenge, murder and detection; originally published as 'Who Killed Zebedee?' in The Spirit of the Times, 25 December 1880. Reprinted in the Seaside Library (vol 45, No 928), 26 January 1880. The narrator's deathbed confession describes a murder case in which he was personally involved as a young policeman. John Zebedee was found stabbed in his bed and although his wife, a known sleepwalker, confessed she was guilty, the case against her was dropped. The narrator, trying to make a name for himself, continued the investigation and discovered from the partially engraved murder weapon that the cook, Priscilla Thurlby, was the murderer, taking revenge on Zebedee for jilting her. The policeman admits he was in love with Priscilla and suppressed the evidence to save her from being hanged. 3 volumes, Chatto & Windus, London 1887. Blue cloth, covers blocked in red, spines blocked in red and lettered in gilt, grey and white floral end-papers. Half-title in each volume. Published in May 1887. Vol III (viii) + 304 pp. 32 pp publishers' catalogue dated April 1887 bound in at end. Chatto & Windus editions 1887-1902. 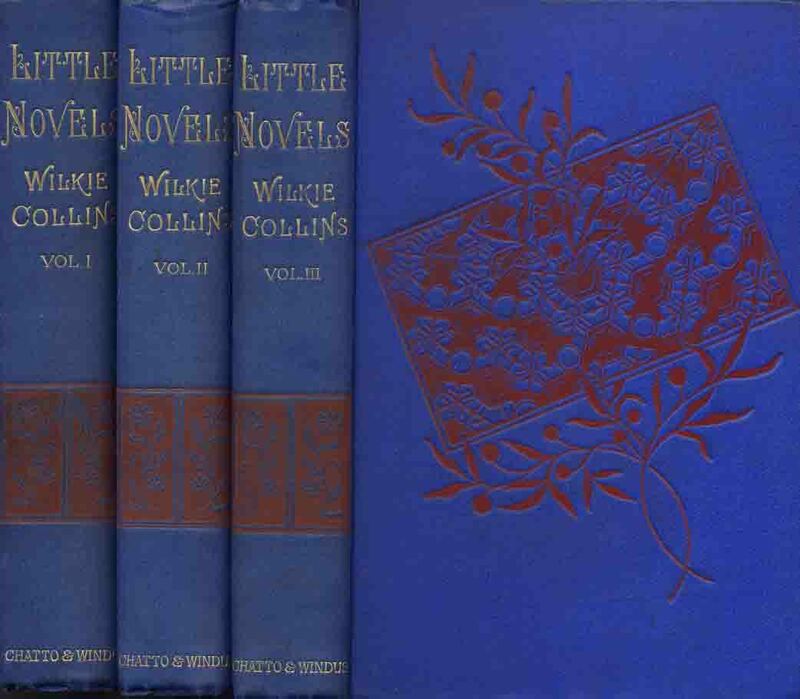 No US edition in this format although some stories were published individually as described above.